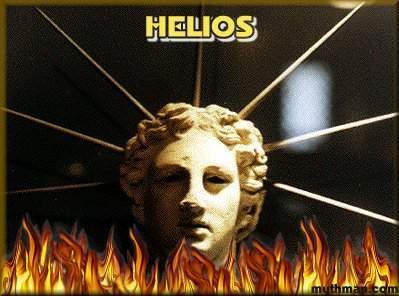 Helios is the young Greek god of the sun, often confused with Apollo. He is the son of the Titans Hyperion and Theia and the brother of Eos (Dawn) and Selene (Moon). By the Oceanid Perse, he became the father of Aeetes, Circe, and Pasiphae. His other two daughters are Phaethusa ("radiant") and Lampetia ("shining"). At the end of each night his sister, rosy-fingered Eos (Dawn), rises from her couch in the east and, mounted on a chariot pulled by the horses Lampus and Phaethon, she rides to Olympus to announce the approach of her brother, Helios. Once Helios appears Eos becomes Hemera (Day) and escorts him on his travels across the sky until, becoming Hespera, she announces their safe arrival on the western shores of Oceanus. Roused by the rooster, his sacred animal, he leaves his splendid palace in the far east and daily travels his four-horse chariot across the Heavens, until finally he reaches an equally-magnificent palace in the far west. The palaces were built by Hephaestus in gratitude for being rescued by Helios when the Giants overwhelmed him during their attack on Olympus. 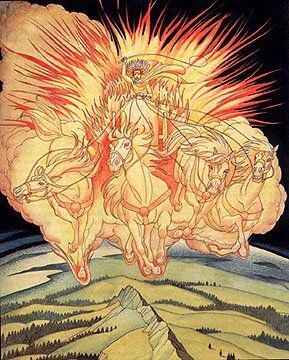 His chariot is pulled by four horses - Pyrois, Eos, Aethon and Phlegon - and often others (see bottom of page). At the end of the day Helios lets his horses graze and rest in the Islands of the Blessed. Afterwards he sails home along the great stream called Oceanus, which flows around the entire world. 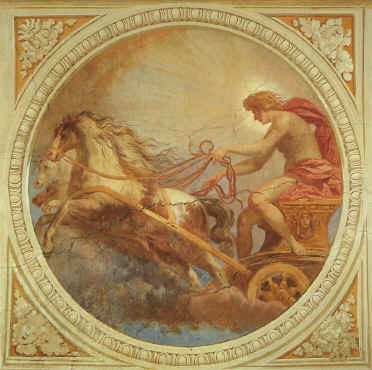 To get back to his far east palace, Hephaestus crafted a golden ferry-boat for the sun god and his chariot and horse team to use, and Helios sleeps comfortably in his royal cabin on their nightly voyage on Oceanus. Helios sees and knows all that happens on earth, and was often called upon as witness, but is not always very observant - some of the companions of the Trojan War hero, Odysseus, once had the nerve to steal some of his sacred cattle, and Helios actually failed to notice it! Probably because he had several herds of such cattle, each herd numbering three hundred and fifty head. Represented as a handsome youth with a halo standing in a chariot, his usual attributes are the rooster, the whip and the globe. His island is beautiful Rhodes, where the worshipful natives in his honor built the Colossus of Rhodes, an awesome statue that straddled the harbor entrance and under whose legs all ships, even the tallest, easily passed. It was the sixth of the seven wonders of the ancient world. Some have said that the Colossus of Rhodes was dedicated in honor of Apollo, god of light, with whom Helios was often confused. In addition to Rhodes, Zeus also added the island of Sicily to the dominion of Helios. This island was a missile that was tossed in the battle with the Giants and had formed Sicily upon landing. Phaethon was the son of Helios and Clymene (or some say Rhode), but didn't know the identity of his real father since his mother now lived with Merops, who was King of Ethiopia. He did know that he was adopted by the King, and he badgered his mother until she revealed to him that his father truly was the sun god. She told Phaethon that he could verify this if he were to visit his father's nearby palace and pose the question to him directly. The youth did just that and once he told Helios who he was, the sun god stood and lovingly embraced him. Feeling guilty because he had ignored his young son all those years, he swore an oath by the sacred river Styx that Phaethon could have whatever he wanted. Name your gift, son. Phaethon impulsively replied that what he wanted most was to drive his father's golden chariot across the sky, much to the dismay of Helios. He knew that the inexperienced boy wouldn't be able to control the frisky team and he took his job very seriously. Not wanting to jeopardize the safety of both the earth and his son, Helios begged his boy to name another wish. To no avail. Phaethon wanted to impress his sisters and show them what a high stature he had attained. He insisted that his father honor the oath, and since a god cannot break an oath sworn by Styx without suffering terrible consequences, Helios reluctantly agreed to his son's request. Phaethon's sisters helped him yoke his father's white horses and offered encouraging words to their beloved brother. But the youth was inexperienced and in his excitement at this incredible ride soon lost control of the strong steeds. They sensed that there was a stranger at the reins and felt free to go wherever they wished, seeing as their new driver didn't follow the usual path. Flying too far from the earth, they caused the inhabitants to freeze and shiver as the sun chariot flew higher and higher, and all the plants began to shrivel and die. But at once plunging down and flying too close to the earth, they scorched and burned the people and landscape, causing terrible grief and hysteria. Zeus heard the anguished cries of the people and, seeing the runaway team of horses pulling the sun, with a terrified Phaethon clinging on for dear life, became very angry. Gaea (Mother Earth), distressed at the danger her realm was in, beseeched Zeus to do something to stop it. Knowing that if he didn't act quickly all life on earth was in serious peril, Zeus chased after the sun chariot on his eagle and, quickly catching up to it, hurled one of his fearsome thunderbolts at Phaethon, striking the foolish young man dead. And though he greatly failed, more greatly dared." Because of this catastrophe it have been said that one entire day went without the sun, but still light was not lacking because the world was burning so brightly from the close fly-by of Phaethon. His mother Clymene wandered the entire earth looking for his limbs and bones and his best friend, King Cycnus of Liguria, mourned so much for his dead friend that he abandoned his kingdom and went weeping along the river Eridanus until finally he was turned into a swan. Phaeton's grieving sisters, the Heliades, were changed into either poplar trees or alder trees and they reside on the banks of the river, where they endlessly weep amber tears. There was a violent disagreement between two men named Atreus and Thyestes, with Zeus taking the side of Atreus over the other man. At stake was the kingdom of Mycenae, a rich and powerful place. Zeus sent a message to Helios, that he should reverse his course at the appointed time. He then told Atreus to make Thyestes swear that he would give up any claims to the throne if a divine miracle, such as the sun going backwards, would occur. Not believing this possible, Thyestes agreed, whereupon Helios turned his horses around and raced towards the dawn, as the seven Pleiades, and all the other stars, retraced their courses in accord with the sun god. That was the first and only day that the sun set in the east. When Zeus desired to lay with a mortal woman named Alcmene so that he could father Heracles (Hercules), he commanded Helios to take three days off. He wanted to turn one night into three because he knew the creation of such a great hero as Heracles could not be rushed. Helios wasn't happy about this but he would never think to disobey the King of the Olympians, so grudgingly he unyoked his team after quenching the solar fires and spent the time in his palace, grumbling about not doing his job properly. Zeus next had Selene (Moon) go slowly and Hypnos (Sleep) to make the world so drowsy that nobody noticed this strange occurrence. Speaking of Heracles, one day the greatest of Greek heroes was busy working and the heat of Helios' beams on his body made him very uncomfortable. Heracles strung his bow and let fly an arrow at Helios, but immediately realized his mistake and apologized profusely to the sun god. Equally courteous, Helios then gave Heracles a golden goblet, shaped like a water-lily, which he used to sail across the great Oceanus. One time the sea god Poseidon got into a dispute with Helios over ownership of Corinth, a rich region of Greece. The argument was left to Zeus to decide and the King of the Olympians ruled that Helios could keep the Acropolis of Corinth and Poseidon would possess the Isthmus of Corinth, which greatly displeased the god of the sea. Since Helios sees everything that happens during the daytime he was the one to inform Hephaestus that his wife Aphrodite was being unfaithful with Ares. Acting on this information, Hephaestus fashioned a net so fine it was nearly invisible, but strong as steel, and captured the two love birds in bed. To punish Helios for being such a big-mouth, Aphrodite caused him to fall in love with a mortal beauty named Leucothoe, and his seduction of her led to her death. It was Helios the all-seeing to whom Demeter turned for information when she was seeking her kidnapped daughter, Persephone. She forced him to admit that indeed it was Hades, god of the Underworld, who had forcibly taken away Demeter's daughter, with the tacit approval of his brother Zeus. In anger she withdrew her services and the earth began to wither and die while Demeter wandered the earth in search of Persephone. Another time the Giants attacked Mount Olympus and threatened to overthrow Zeus. These Giants were long-haired and bearded and had serpent tails for feet. Sons of Mother Earth (Gaea), the Giants numbered twenty-four. Told that he had to find a certain herb of invulnerability before his enemies, Zeus commanded Helios and his sister Selene, the moon goddess, to stop shining for a while. Under the cover of darkness, guided only by the feeble light of the stars, Zeus groped around the earth until he found the plant and brought it safely to Olympus. Shortly thereafter the Giants were defeated. One of the worst things a mortal could do was to compare themselves to a god, and Helios was no different in resenting such stupid boasts. Even though he wasn't a mean god, still he felt he had to punish those who disrespected the Olympian gods. A huntress named Arge was quite full of herself and in her mind thought that she was the fastest being alive. One time, while pursuing a stag, this vain woman claimed that she would catch it even if it ran as fast as Helios. To punish her for this thoughtless boast, Helios turned Arge into a doe. Lampos, Actaeon, Chronos, Aethon, Asterope, Bronte, Pyroeis, Phaeton, Erythreos, and Phlegon are some of the many winged steeds that are the residents of Helios' Sun-stables. Pegasus, when not in attendance with the Muses or bearing Zeus' thunderbolts in a storm, often resides here as well. Phaeton was so named in honor of the deceased son of Helios (Sol) by the same name. Aethion ('fiery red'), Asterope ('starry eyed'), Bronte ('thunder'), and Phlegon ('the burning') most often drive Helios' chariot, while Lampos ('torch') and Actaeon ('effulgence') are used by Apollo for his own sun-chariot.